Looking for easy chicken recipes? Try this twist on the classic BLT. For those with food allergies this recipe does not contain wheat, gluten, dairy or any of the most common food allergies. If you are allergic or sensitive to tomatoes this recipe still taste great if you need to omit this ingredient. Rice Chex has become one of my favorite new ingredients to use with chicken; it adds a great flavor and is wheat and gluten free! Start by following package directions to cook 1 cup of Arborio Rice (some take 20-30 minutes to cook with 2 cups of water). In a blender combine Chex and seasonings, blend until consistency is like flour, set aside. Cube chicken and place into a bowl, pour Chex mix over cubed chicken and toss to coat all pieces. Place chicken into large pan along with 2 tsp of olive oil. Cook on medium high heat. Chopped and dice the bacon into small strips, toss into pan with chicken, continue to cook on medium high heat, stirring occasionally to prevent sticking. Cook chicken and bacon for 10-15 minutes and then add in chopped kale. Allow cooking for 15-20 more minutes stirring occasionally (check the chicken and bacon to make sure thoroughly cooked before serving). Cube avocado, mango and tomato(optional) and set aside. 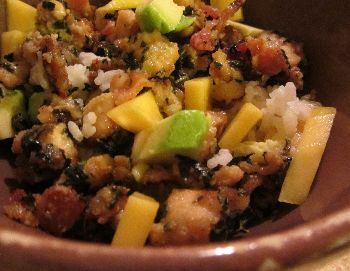 Scoop ¼ of Arborio rice into a bowl and top with chicken and bacon mixture. Top and serve with avocado and mango. If you aren’t allergic add in a tomato for extra flavor and color. Click here for more easy chicken recipes? Return from Easy Chicken Recipes to Food Allergies Home Page!